A 5-Gigabyte storage space is assigned to each user account on the CCSD’s FTP server. This facility is available for users to store files in any format. Your documents will be available in your FTP storage for a temporary up to a maximum of one month. The files being available in your storage will be automatically displayed when you make a deposit (See. Deposit > upload files). To view the files available in your FTP storage, go to “My Space/My documents in FTP Storage”. 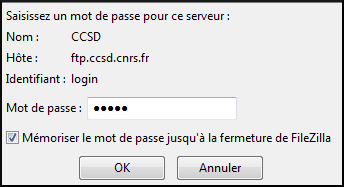 To upload documents to you FTP storage, you need to install an FTP client on your computer. In the following, two applications are documented : Filezilla and FireFTP. Type the password for your user account (HAL account), and click on “OK”. 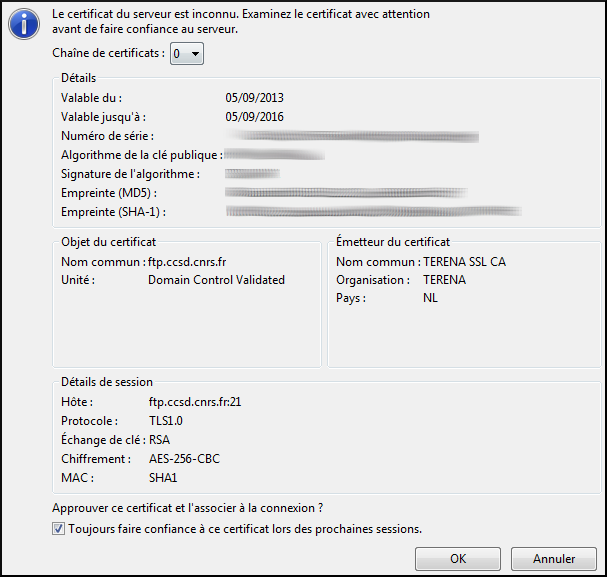 Check this box: “Always trust this certificate during future sessions”, and click “OK”. 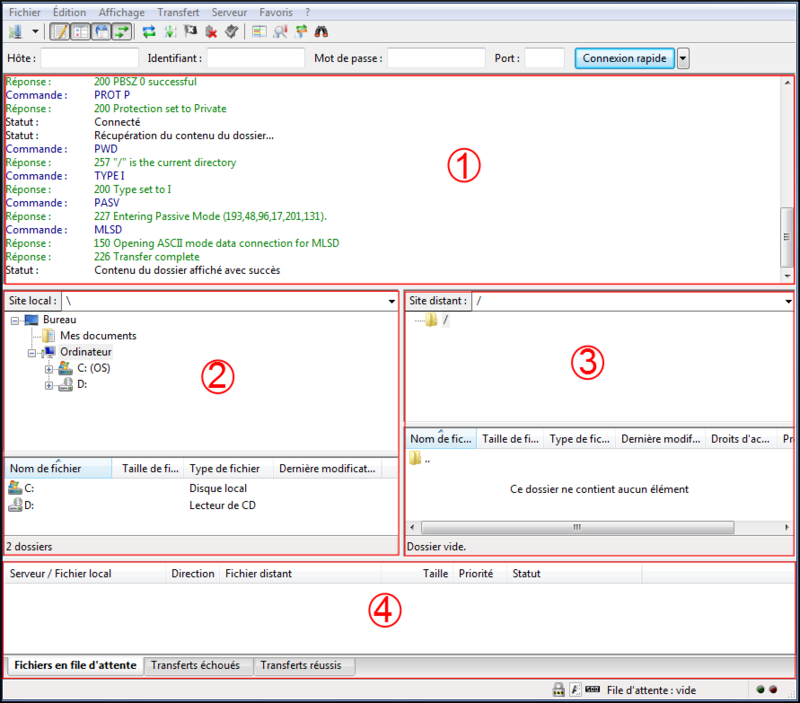 N.B: FileZilla will prompt you whether a connection to the host could established or not. In case of non-functioning (message: “inaccessible network”), it is possible that the antivirus installed on your machine is the cause. Please configure your antivirus to not check ports 20 & 21. If necessary get closer to your IT department. To upload a file, you need to pick it up for FileZilla’s Area 2. Double-click on the file or drag-and-drop it from Area 2 to Area 3. 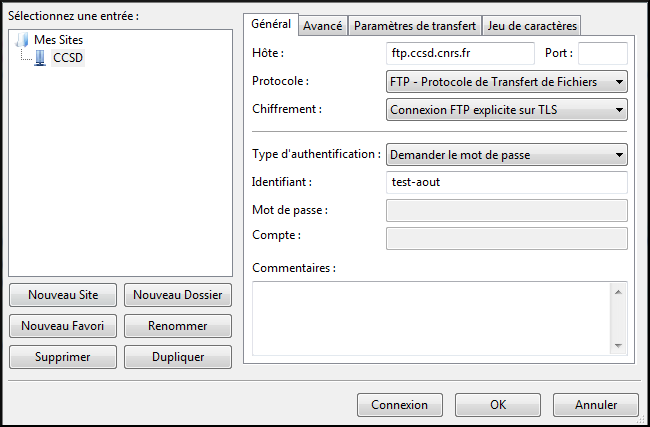 Have a look on FileZilla’s Area 4 to see whether your transfer worked. Mozilla has removed the support of FTP from its browser, FireFTP is no longer available for Firefox. It is recommended to use waterfoxproject.org (web browser dereived from Firefox) to use FireFTP.